8'x 16' - 128 Sq. Ft. 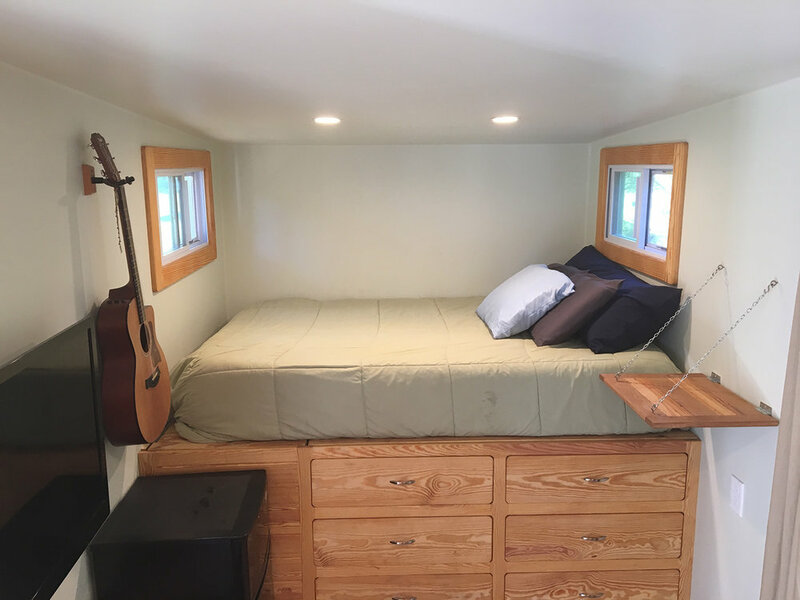 The Rambler is the smallest building in our Tiny Home family. At only 128 Sq. Ft., this "house" is best used as a detached bedroom or clubhouse, making it a perfect solution for those who want to add a room to an existing house without the mess of renovating. The Rambler features a queen bed with ample storage space and drawers below, a desk area and room for a wall-mounted TV and entertainment center. Of course, this model's interior can be modified to suit your needs. Learn more about the construction of the Rambler on our Blog! The cost of heating and cooling The Rambler is very low due to the super-insulated SIPs walls and sealed fiberglass exterior.